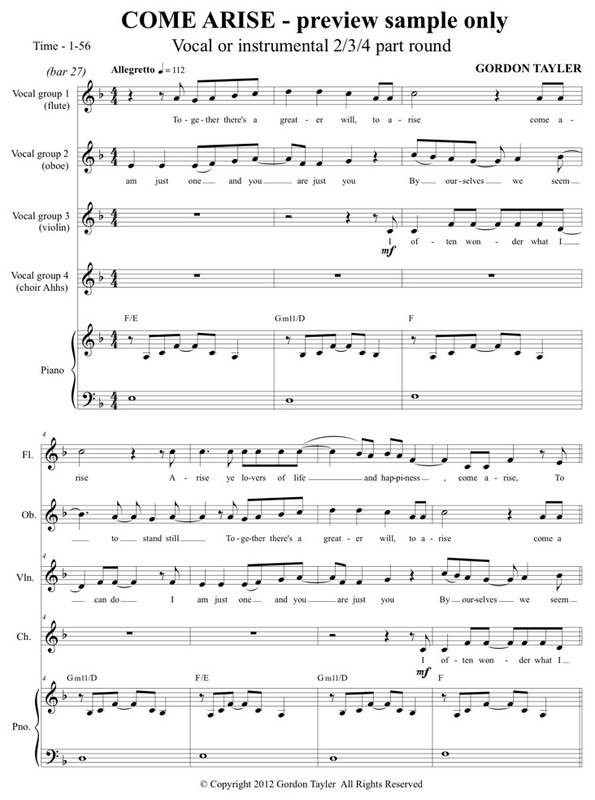 This joyful vocal or instrumental round can be worked in 2, 3 or 4-parts. The melody has some syncopation, but with enough repetition, most upper primary children will be fine. As with any round, everyone learns and sings in unison for awhile, and then try the round in two parts, gradually building into 4 parts. Children are such social beings with a natural love of life – so lyrically, the song is saying ‘give each moment all the love and joy that you can – it is a an magnetic gift that draws others to us. The piano accompaniment has been kept very simple, so that classroom teachers with very basic piano skills can still accompany their children without necessarily calling on the services of their music specialist. The seemingly complex chord of G minor 11/D may need some explanation – the 11 comes from the inclusion of the 4th & 7th degrees; the /D refers to the predominant bass note in the chord). Guitarist can best accompany this round in the key of E major (down a semi-tone) – just slide an extended E chord up to 2nd (F#m11/C#) & 4th (E/D#) position. Alternatively, just use the MP3 backing track to accompany.